Colombia is at a historic crossroads as its leaders implement peace accords that will end an undeclared but bitter civil war that has raged for more than half a century. Building a nation at peace will require the input and collaboration of both Colombians and the world community. Yet relatively little is known about Colombia in the United States and abroad. 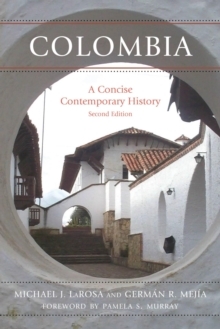 This deeply informed and accessible book traces the history of Colombia thematically over the past two centuries. In twelve interlinked chapters, Michael J. LaRosa and German R. Mejia depart from more standard approaches by presenting a history of political, social, and cultural accomplishments within the context of Colombia's specific geographic and economic realities. Their emphasis on cultural development, international relations, and everyday life contrasts sharply with works that brand Colombia as a failed state, focusing on its violent past or on an economy deeply dependent on narcotics. Instead, the authors emphasize Colombia's remarkable national cohesion and endurance since the early nineteenth century wars for independence. They explore two distinct eras: the "long nineteenth century" (1780-1899) and the "ongoing twentieth century" (1899-present). Including a photo essay, detailed chronology, and resource guide, this concise yet thorough history will be an invaluable resource for all those seeking a thoughtful, definitive interpretation of the rich heritage and dynamism that have characterized Colombia past and present.